The fruit tree collection at Rural Ridge began as many home orchards do--as a hobby. After buying the property in 1986, Bud Shelton, the family patriarch, started a large garden and began looking at other agricultural possibilities for the land. In 1992, Charlotte Shelton, now CEO of Vintage Virginia Apples and Albemarle Ciderworks, attended a tasting of rare and heirloom apples at Thomas Jefferson's Monticello. There she visited with Tom Burford, an old family friend and connection from Amherst county, a celebrated nurseryman and apple expert. With Tom's guidance, and the collective talents and energy of the Shelton family, the orchard grew to encompass the 200-plus cultivars growing here today. Many heirloom apple varieties grow here, with names like Ashmead's Kernel, Albemarle Pippin, Ralls, Baldwin, Winesap, and Esopus Spitzenburg. Other fruits are cultivated here as well: pears, peaches, plums, apricots, cherries, and even quince. These fruit varieties each have their own personality and their own uses, from eating fresh to cooking and canning. Of course we have included apples best suited for juice and cider making. The seasonal ebb and flow of our vintage fruit orchard in Virginia is a beautiful thing. It's a rhythm that links us to our agrarian past, provides refreshment and purpose for body and soul in the present, and will, we hope, see us into the future with our roots anchored firmly in the ground. Come out and enjoy it with us! Stay me with flagons; comfort me with apples. 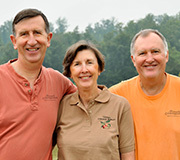 Vintage Virginia Apples and Albemarle Ciderworks are owned and operated by the Shelton family, pictured above. Learn more about our history.